Ion drift meter observations from the Atmosphere Explorer E satellite during the period of January 1977 to December 1979 are used to study the dependence of equatorial (dip latitudes ≤ 7.5°) F region vertical plasma drifts (east-west electric fields) on solar activity, season, and longitude. The satellite-observed ion drifts show large day-to-day and seasonal variations. Solar cycle effects are most pronounced near the dusk sector with a large increase of the prereversal velocity enhancement from solar minimum to maximum. The diurnal, seasonal, and solar cycle dependence of the longitudinally averaged drifts are consistent with results from the Jicamarca radar except near the June solstice when the AE-E nighttime downward velocities are significantly smaller than those observed by the radar. Pronounced presunrise downward drift enhancements are often observed over a large longitudinal range but not in the Peruvian equatorial region. The satellite data indicate that longitudinal variations are largest near the June solstice, particularly near dawn and dusk but are virtually absent during equinox. The longitudinal dependence of the AE-E vertical drifts is consistent with results from ionosonde data. These measurements were also used to develop a description of equatorial F region vertical drifts in four longitudinal sectors. 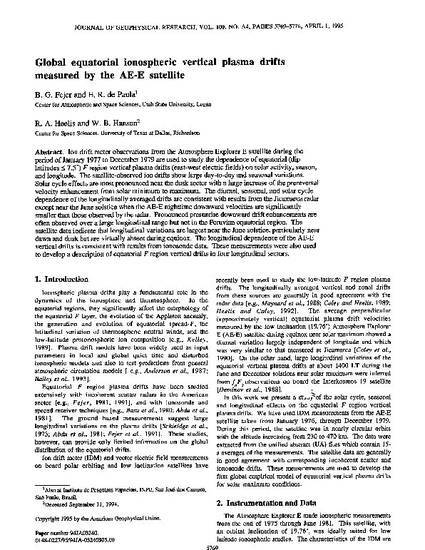 Fejer, B. G., E. R. de Paula, R. A. Heelis, and W. B. Hanson, Global equatorial ionospheric vertical plasma drifts measured by the AE-E satellite, J. Geophys. Res., 100, 5769, 1995.